It’s that time of year again – time to think about Valentines, and kisses, and……Dental Disease. If you are a client of ours, you have heard us talk about dental disease prevention a number of times. A dental exam is part of our thorough and regular examination of your pet, and we always make recommendations for treatment and preventative care at every visit. Have you ever wondered why we care so much about dental disease in cats and dogs? FACTS ABOUT DENTAL DISEASE : It can lead to damage to or loss of gum tissue and bone around the teeth as well as bone infection. Bacteria from the mouth can enter the bloodstream and is associated with diseases of the heart, liver, and kidneys. SIGNS OF DENTAL DISEASE : Bad Breath, Drooling, Difficulty chewing or eating, Vomiting, Gums that are swollen or red, or bleeding, Brownish-yellow tartar on teeth, Receded gums, Loose or missing teeth, Loss of interest in playing with toys, anxious or aggressive behavior. It’s important to remember that certain species and breeds that are driven by food will not stop eating until their dental disease is very advanced. They will push through the pain to eat. 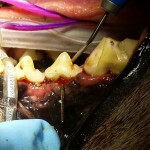 The picture above shows a dog with advanced (stage four) dental disease. 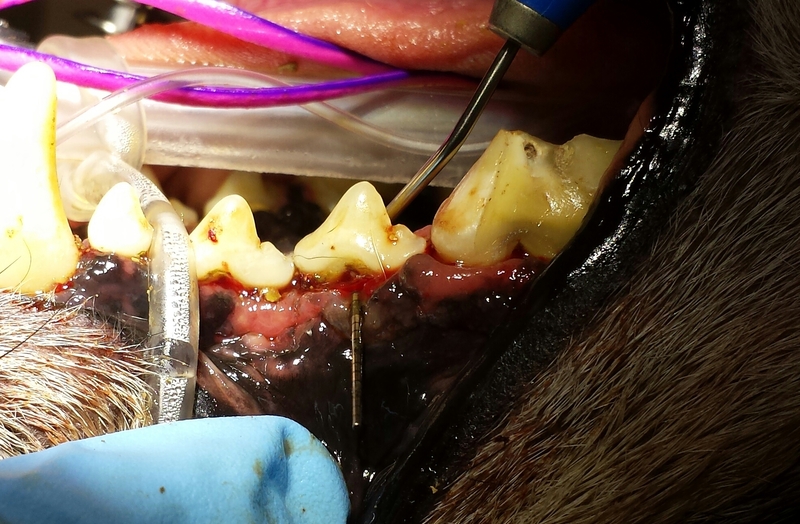 Once the tartar was removed from his teeth we discovered significant bone loss, infection, and tooth fracture that required several teeth to be removed. We never want things to get this out of hand in your pet’s mouth! For the month of February we are offering FREE DENTAL EXAMS to promote dental awareness in Dogs and Cats. Your pet’s dental exam will include an oral examination, recommendations for dental treatments or prevention, and a consultation about your pets overall dental health. You will also receive a 10% DISCOUNT on dental products purchased in February and dental procedures performed by March 15th. All of our dental procedures include dental X-Rays to ensure that we have a full picture of the progression of dental disease in your pet. Ever wondered why we use general anesthesia during dental procedures? Click here to learn more!